This time, not really a repair, but an upgrade. Every lab or repair shop dealing with really high frequency circuits needs one: a microwave counter. The EIP 54x series has certainly been (and still is) one of the workhorses of the industry. EIP is now Phase Matrix, still selling counters. But I guess, not an easy tasks – there are quite a few of the EIP counters around, and they do have some little issues with tantalum capacitors, etc, but all in all, the EIP counters are really marvelous instruments, rock solid. Fortunately, there are clever people around, at the Green Bay Professional Packet Radio club (“GBPPR”), which kindly provide the ROM images and some circuit modification info on the web – to convert a regular 545A, to an option 2 545A! Well, first we need to collect some parts, a low capacity Schottky diode (HP 5082-2835, 1 pF max. ; original EIP circuit uses a different kind, but really any low capacity Schottky will work), a DM8136N (a comparator/address decoder), a 74LS244 buffer, and an AD7524JN (8 bit DAC) – plus, a 10k resistor. Except for the DM8136N, nothing uncommon at all. The only tricky part, at least here – the 2532 EPROMs. These aren’t accepted by any of the programmers around, and they need a high programming voltage. So first, put together a little programmer that attaches to an ATmega32L, and with the data transfered by USB. It’s really crude – I don’t anticipate a lot more 2532 EPROMs that need programming, except for the EIP…. I had some 2532A around which are working perfectly fine, just lower programming voltage. 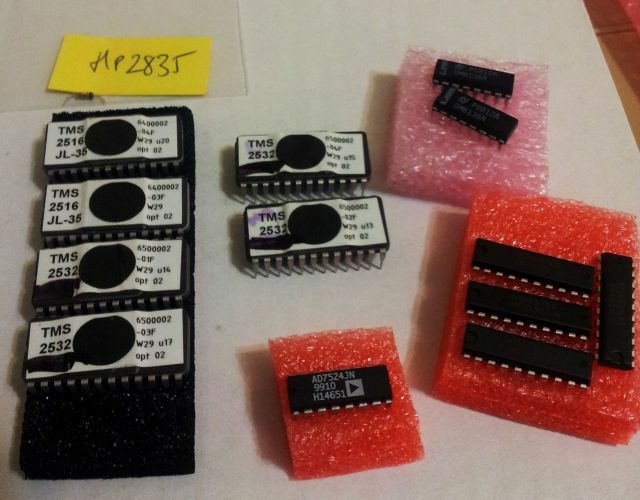 The 2532A/2532 – they can be handled by some 2732 programmers, for reading the contents, with a little socket adapter (2532 and 2732 have different pinouts!) – but strangle, the same programmer doesn’t work for writing to the these old beasts. 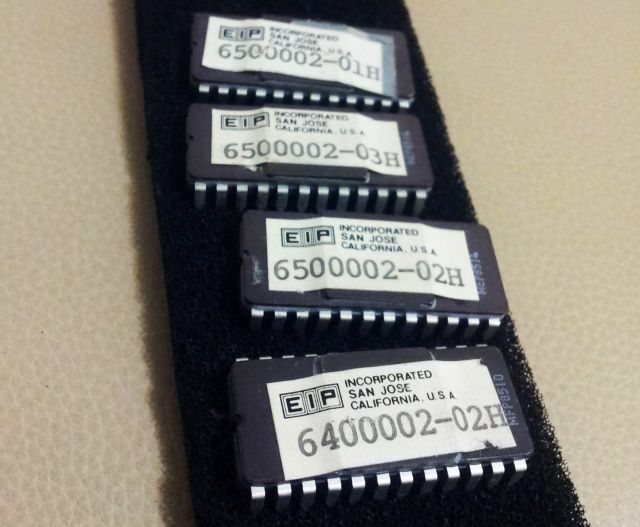 The second type, they are 2516 EPROMs, no problem with a 2716 programmer. These are the boards, A105 and A107, with the parts installed – red rectangles: additional parts; yellow: removed parts (resistors R39 and R40). I would suggest to put all parts in sockets, like EIP did. Then you can change your counter back, to non-option 2, should you ever want to. 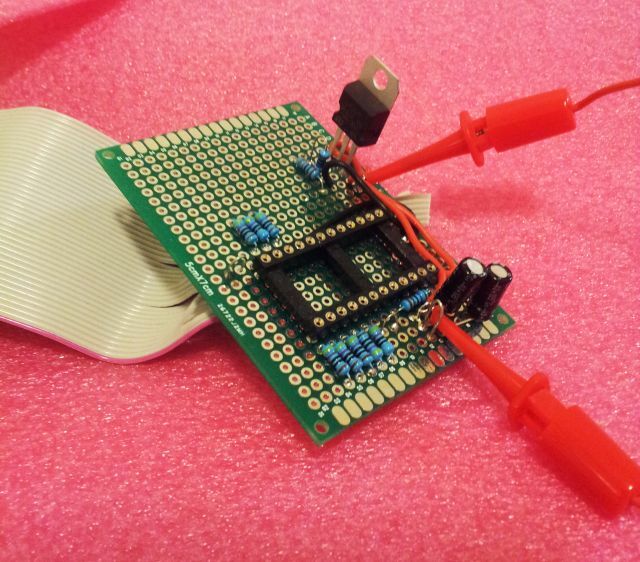 After a bit of soldering – that what we have – a working option 2 EIP 545A. The power meter can be switched off – if you need the extra digits. Typically, I don’t. All that is left are the original EIP EPROMs, programmed in San Jose, California. Collectables. Thank You, I will send you username/password for manual collection with private message. Would you consider doing the modification for someone else? Sure, just keep in mind I am living in Germany so it is pretty expensive to ship the unit here. 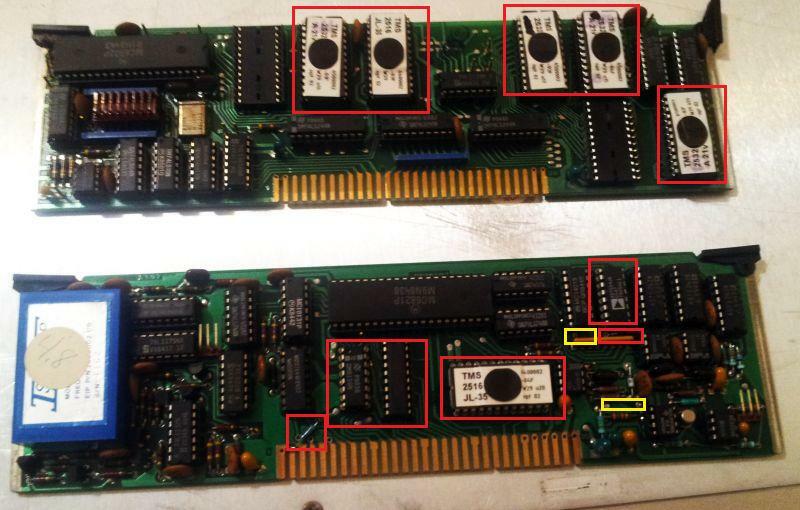 Otherwise, I can also offer a set of EPROMs, or can modify the boards only – however then I can’t test the full unit. Just got an EIP 545A without the power option. Could I purchase a set of EPROMs from you? Also looking for a DM8136N. Some on Ebay but at pirate prices. Thanks Simon. Look forward to following up when you get back. Much appreciate your help. I have an EIP 545A as well and would be interested in acquiring a chip set. Simon, please let me know if this is a possibility. Hi Tom, Sure, this is possible. Currently I have not enough 2532A here, but some are on order, so probably I can send you a set late March. DM8136, and 74244, available as well. The AD part, no spares at the moment, and the Schottky diode, I have some, do you need this as well? If still interested, just send a message to simon@simonsdialogs.com some time mid March. Thanks Simon, I sent a follow up message at the email address you listed. Do you have a link to the EPROM files for the modification? I have an ancient EPROM programmer that can program 2716’s and 2732’s, but I can’t find the code anywhere. As per the previous post I am also interested to know if a 548A can be modified in the same way as a 545A or are the EPROMs different? Hi Geoff, I have never tried the modification on a 548, the hardware is almost the same, so for this part I don’t expect issues. But you would need a 548A/B EPROM set, or at least the binaries. Congratulations for this huge work! I have a 545B and I’m considering to add power meter too. Are you still selling the programmed EPROM (and the rest of the kit by the way)? Hi, Guile, at least one set of EPROMs, and the Schottky diode. The other parts, I need to check, but don’t think I have any of the devices left, maybe some of the logic chips – but these are still available anyway. Thanks for this quick answer! As long as the programmed EEPROM are available I’m fine. I just need to know how to place the order. Do you have EPROM files for 548B ? Great work on adding option 02 to the EIP frequency/power meter. This is very much needed. I have a EIP 548A, actually two of them, neither of which has the power option. I would like to buy a set or 2 sets of pre-programmed eproms from you and any other associated parts parts to do the power meter upgrade/conversion to my EIP 548A’s. Not sure if the update will work with the 548a, probably not!